This exhibition was organized as part of Tacoma Art Museum’s 80th birthday celebrations and specifically to highlight the early legacy gifts on which the museum’s rich collection was built. The works on view in this gallery are from the museum’s collections of European and American art. They were selected through voting online and in person by our members and visitors. Artworks from these collections are favorites whenever they’re shown and often requested when not on view. The core of TAM’s European art collection is a group of more than 40 paintings and drawings from the estate of Mr. and Mrs. W. Hilding Lindberg which were donated to the museum in 1983. The Lindberg Collection consists primarily of French and German paintings from the second half of the 19th century. Several sculptures and some prints have been added since that time. TAM also owns a small group of oil and watercolor paintings and drawings by American artists from outside the Northwest who were pioneers in the modernist art movement in the early 20th century. The works were acquired primarily through donations from Eulalie Wagner (Mrs. Corydon Wagner, Sr.) and Helen Murray (Mrs. L.T. Murray, Sr.) in the 1970s and early 1980s. Related prints were added in 1970 as part of a group of works the museum acquired from collector Carolyn Schneider. Over 500 people cast their votes as to which artworks they most wanted to see from these collections, with the most popular work winning the coveted spot on the front title wall. We also asked those who voted to tell us why this work was a favorite or what they would like to know about the artwork or the artist. A selection of their quotes and questions are included on the object labels. To all those who voted, thank you! We hope you enjoy your show. Celebrating 80 Years: People’s Choice is organized by Tacoma Art Museum. 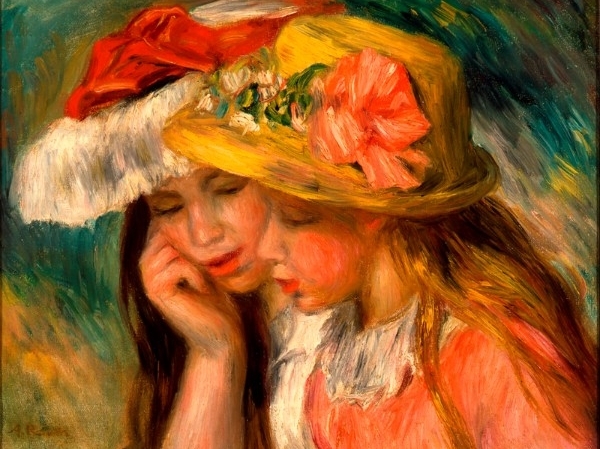 Top: Pierre-Auguste Renoir (French, 1841 ‑ 1919), Heads of Two Young Girls, 1890. Oil on canvas, 12¾ × 16¼ inches. Tacoma Art Museum, Gift of Mr. and Mrs. W. Hilding Lindberg, 1983.1.35. Right: William James Glackens (American, 1870 ‑ 1938), Natalie in a Blue Skirt (detail), 1914. Oil on canvas, 24¼ × 18⅛ inches. Tacoma Art Museum, Gift of Mrs. Corydon Wagner, Sr., 1971.1.